Keep your HP laptop, smartphone, or accessories fully charged on-the-go, with the HP Spectra USB-C Power Pack. A 20,100 mAh power output, portable design, and generous port selection lets you extend your workflow, without losing power. Powerful 60W output: Charges your HP USB-C laptop or other devices efficiently from anywhere. 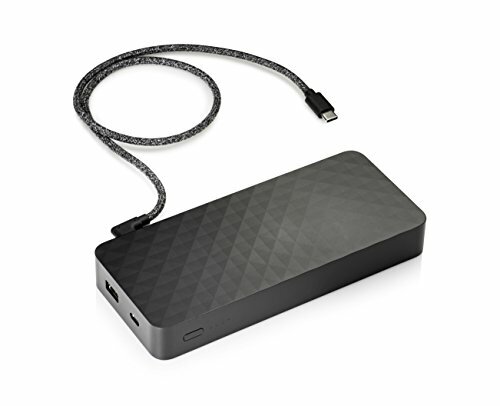 20,100 mAh power capacity: Charge your HP USB-C laptop, smartphone, or accessories on the go. Two USB-C ports and one USB-A port: Charge up to three devices simultaneously. Protective case included: Store your power bank and cables to prevent bumps and scratches. Accelerated charging: This power bank charges fully in 2-3 hours. Compatibility: Rigorously tested across HP Spectre laptops and HP laptops with USB-C charging ports and AC adapter of 65W or less. Dimensions and weight: 6.65 x 2.9 x 0.91 inches (169 x 73.6 x 23 millimeters); 0.95 pound (0.432 kilogram); cable length 24.4 inches (620 millimeters).